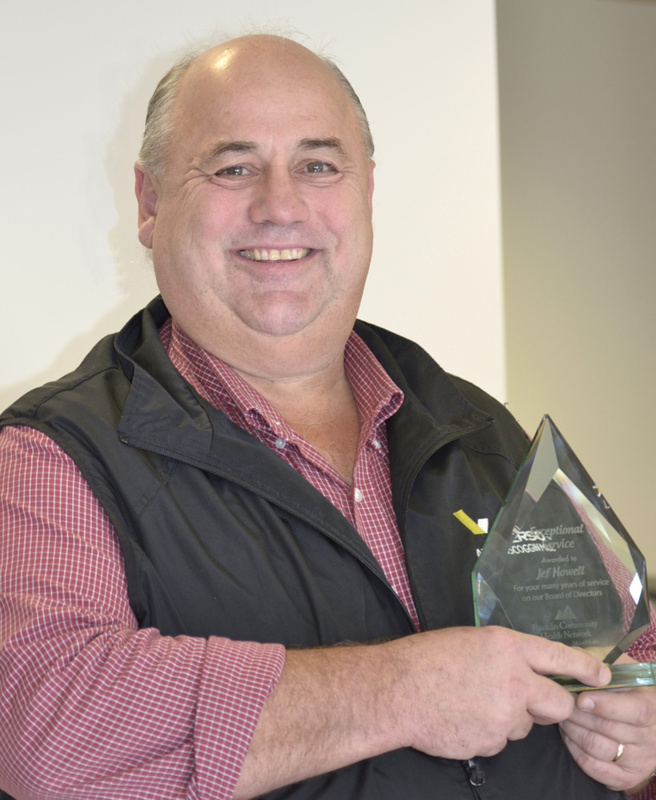 Jef Howell, a former 30-year resident of Livermore, was presented an award for his many years of service and dedication at the Sept. 22 Franklin Community Health Network/Franklin Memorial Hospital board of directors meeting. Howell served on the FCHN/FMH board of directors from 2004 to 2013 and the organization’s finance committee from 2004 to 2015, serving as treasurer and chairman for five years. During his tenure he also has served on multiple search committees for senior leadership, including for chief financial officer in 2011 and chief executive officer in 2008. Howell was also a member of the organization’s patient experience team and investment committee. Beginning in December 2008, Howell was part of a special committee to evaluate facility options and capital investment returns to make a recommendation to the board of directors regarding the feasibility of building a medical arts center in the Livermore Falls area. The committee’s recommendation came to fruition in January 2012 when the Androscoggin Valley Medical Arts Center opened. Howell currently serves as purchasing manager for Verso Corporation’s Androscoggin Mill. He started at the Jay mill in 1981 shortly after his college graduation. Howell and his wife, Cathi, now reside in New Harbor. They are the parents of two adult daughters who live in the Boston area. Two local women recently opened Borrow My Boutique, a Brunswick-based rental boutique located at 124 Maine St., Suite 104 in the Senter Place building, according to a press release from the boutique. The store will be open from 10 a.m. to 6 p.m. Tuesday through Saturday. Ria Glenn DeMay, of Hallowell, and Stacey Rice, of Augusta, met while working at Colby College. 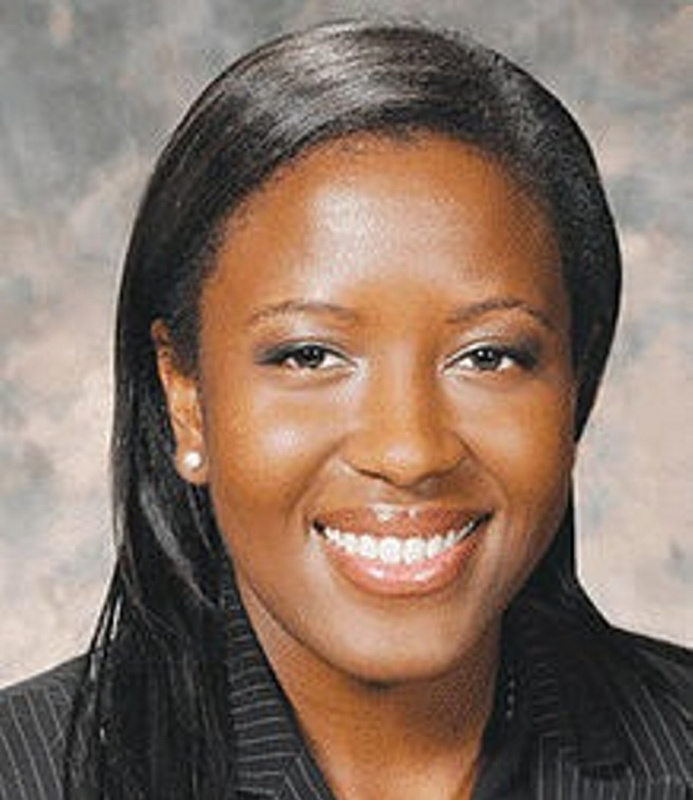 DeMay is an attorney and Rice is a former marketing specialist. Borrow My Boutique caters to customers who want to update their wardrobes by renting designer dresses, handbags and accessories. The boutique offers customers an opportunity to rent dresses for everything from interviews and meetings to weddings, proms and parties. Customers also have the option to purchase any items in the store. The boutique gives customers the Rent to Own option for authentic high end handbags by designers such as Coach, Michael Kors, Kate Spade, Gucci and Louis Vuitton. Borrow My Boutique will also be taking new and very gently used designer handbags and dresses on consignment. The boutique will be having periodic giveaways for those who join their email list. They recently gave away a Michael Kors bag valued at $248 to one lucky winner who joined their email list and liked them on Facebook. For additional information regarding Borrow My Boutique, visit www.borrowmyboutique.com/. Chip Eastman, former owner of Reitze Electric of Augusta, has recently joined the Augusta Fuel Company team. At AFC, Eastman will be helping to grow the AFC Electrical brand residentially and commercially. 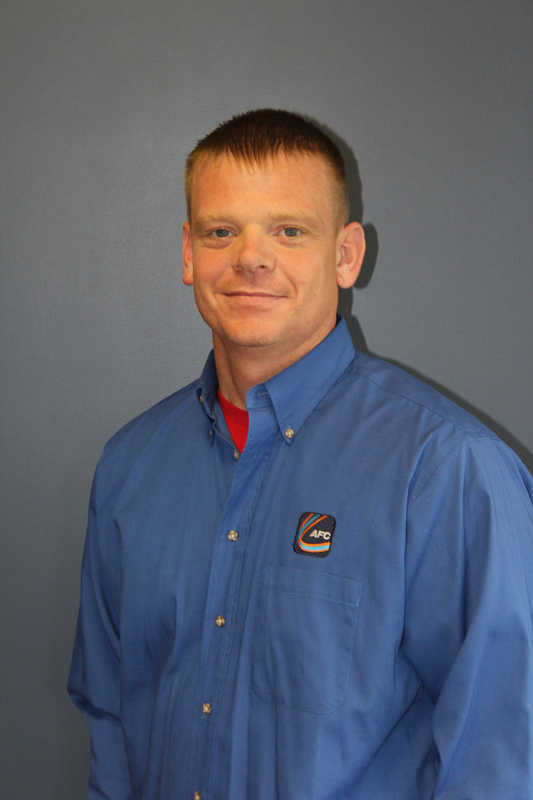 Eastman is a master electrician and brings almost 15 years of field experience with him. In his early career, Eastman spent three years serving in the U.S. Army as a light infantryman, followed by 5 years in the IBEW electrical apprenticeship program. Most recently, Eastman has been working at the Capital Area Technical Center at Cony High School as the electrical construction instructor where he has enjoyed teaching students the ins and outs of electrical work. Since 1888, AFC has worked to provide the best home and commercial comfort solutions with a professionalism and reliability that is unmatched. They provide heating oil and propane products as well as heating, plumbing, electrical, home cooling and commercial HVAC services for the central Maine area. They can be reached by phone at 623-3851 or found online at www.afccomfort.com. Cedar Ridge Center has been selected as a 2015 recipient of the Silver Achievement in Quality for its outstanding performance in the health care profession. The award is one of three distinct awards possible through the National Quality Award Program, presented by the American Health Care Association and the National Center for Assisted Living. The competitive award program highlights select centers across the nation that serve as models of excellence in providing high-quality long-term and post-acute care. Implemented in 1996, the National Quality Award Program is centered on the core values and criteria of the Baldrige Performance Excellence Program. The program assists providers of long-term and post-acute care services in achieving their performance excellence goals. The program has three levels: Bronze, Silver and Gold. The awards are sponsored by AHCA/NCAL Associate Business Members My InnerView, by National Research Corporation and PointRight. Cedar Ridge was one of 128 centers to receive the Silver level award, which was presented during the AHCA/NCAL 66th Annual Convention and Exposition Oct. 4-7 in San Antonio, Texas. Cedar Ridge is a newly renovated, 74-bed facility set in central Maine and offers full rehabilitation services, an enhanced meal plan, numerous recreation and leisure opportunities and 24-hour skilled nursing care. Patricia Quinn is scheduled to speak at the Chamber’s Leading Women’s Luncheon, which will be held from 11:30 a.m. to 1 p.m. Nov. 3 at O’Brien’s Event Center in Waterville. Leading Women’s Luncheon is a series of events organized quarterly by Mid-Maine Chamber of Commerce and sponsored by Anthem. Each event in the Leading Women’s Luncheon series features a woman who has achieved great success in her field as a guest speaker. Though the series focuses on women’s experiences and challenges in pursuing successful careers, men and women are equally welcome to attend the event. Quinn is a native of Connecticut and holds a bachelor of science degree in business administration and marketing. 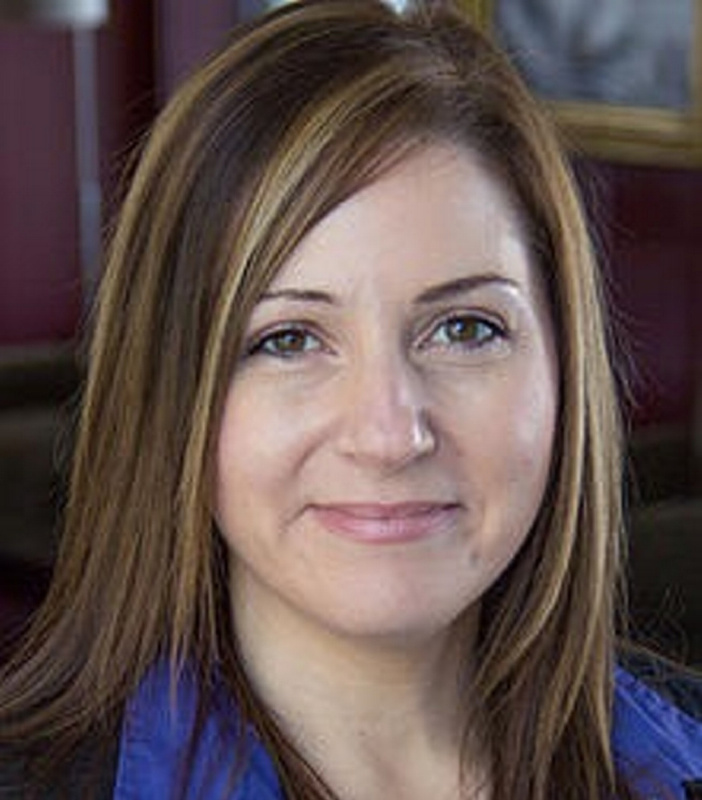 She joined the Northern New England Passenger Rail Authority in October 2000 to promote the inauguration of the Downeaster and was officially appointed executive director in September 2005. Patricia received the Amtrak President’s Service and Safety Award for State Partners in 2007, was recognized as one of “Maine’s Most Intriguing People” by Portland Magazine in 2009, a “Woman to Watch” by Maine Biz in August 2011 and “Non-Profit Business Leader of the Year” by Maine Biz in March 2014. Registration for the event is $25 general admission, which includes admission and luncheon buffet. Space is limited, so pre-registration is preferred. The Leapfrog Group recently awarded Franklin Memorial Hospital an “A” as determined by its national ratings program, according to a press release. The Hospital Safety Score is the gold standard rating for patient safety, compiled under the guidance of the nation’s leading patient safety experts and administered by The Leapfrog Group, a national, independent nonprofit. Developed under the guidance of Leapfrog’s Blue Ribbon Expert Panel, the Hospital Safety Score uses 28 measures of publicly available hospital safety data to produce a single A, B, C, D or F score, representing a hospital’s overall capacity to keep patients safe from preventable harm. To view Franklin Memorial Hospital’s scores as they compare nationally and locally and to find safety tips for patients and their loved ones, visit the Hospital Safety Score website at www.hospitalsafetyscore.org. The National Association of Women in Construction Maine Chapter 276 inducted its new board of officers and directors at its October board and membership meeting at the Senator Inn in Augusta. Board of officers are president, Robin Wood of Reed & Reed; vice president, Heather Berlinski of Kleinfelder; treasurer, Bethany Martin of Reed & Reed; recording secretary, Mackenzie Kersbergen of Maine Department of Transportation; and corresponding secretary, Lori Gile of Auburn Concrete. The board of directors are Margo Walsh of Maine Works; Rachel Theriault of All States Asphalt, Inc.; Brooke Glidden of Kleinfelder; and Kyla Magnusson of Preferred Construction Management. NAWIC is a not-for-profit organization with a core purpose to enhance the success of women in the construction industry. This new board is charged with leading the membership in their community service, mentoring, networking, membership recruitment and fundraising efforts for the next year. The Maine Chapter has awarded more than $300,000 in scholarships to Maine college students pursuing a construction related degree.